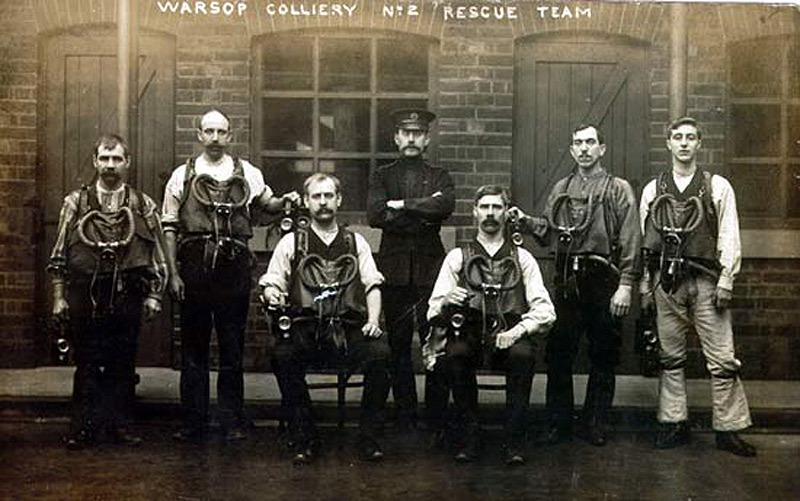 Whilst checking information for Warsop, I came upon your site and saw the photo of the Mines Rescue Team. I have a photo of my husbands great grandfather George Langton standing in exactly the same place with the same uniformed chap in the middle. Can you tell me where this building is/was, and if it still stands? I would love to take my husband there and stand him in exactly the same place! We live in Warsop, so it probably wouldn't be far. Thanks for putting my photo on. I went to look at Bilbecks on York Street, but it has been built on at the front. You can just see the roof, but I haven't asked if I can go around the back to check that. There is a book on Mansfield Woodhouse, showing a shot of York Street with the building on it, so its definitely that place. What a pity they spoiled the facade with the 60's glass and pebble-dashing! Warsop Main Mines Rescue Team. Warsop Main like all collieries, had their own Rescue Station where they kept all their life saving equipment and a number of canaries for early gas detection underground. The Rescue Room at Warsop Main Colliery was within the baths block with access from the pit yard, not at the newer Mines Rescue Station at Mansfield Woodhouse. All my mother’s side of the family worked at Warsop Main, from my grandfather George Langton, to his sons George and John and Johns son Edward (Eddy) Langton. George senior and sons George and John were also in the First Aid team at the colliery. Would you pass this on to Adele. My mother was Hilda Langton, sister to George and John. Regarding the above photo, it might be Mansfield old station. It is situated on Yorke Street just a stones throw from the new station. After the move, it was sold to a plumber’s merchant called Bilbeck. I think they are still trading today, but I don't know how much of the original buildings are still there. In the photo you sent there are down pipes. The left side one in front of a door, so they are obviously not attached to the wall but are away from it. If you look at the photo I sent with the men running down the staircase, this was taken in the inner quadrangle which was surrounded on all four sided with a covered walkway and drainage pipes similar to your photo. The windows are different, but they could have been replaced. Perhaps you could pass this on to Adela. - If she goes to www.bilbeck.com she will get onto their home information page. If she scrolls down to "Contact list & Location Map", there is a full list of everyone in the company, with phone numbers, emails and all other contact details. It might be worth her contacting the manager to find out exactly what is left of the old station. I have been looking at the pictures of the Mansfield rescue teams in the first one there is an unnamed person third from the left on the back row. This guy is Billy Anderson. Gavin Price worked at Mansfield Woodhouse Rescue Station. Just found your site and it brought back many memories of a very, very special man who worked at Mansfield Woodhouse Rescue Station. Gavin Price. My ex husbands father and grandfather to my children. Gavin was a radio controller; he passed away at work at the rescue station in 1990. He was so proud of his job and he gained great pleasure acting as 'Santa' to the children of the rescue staff at the Christmas party. 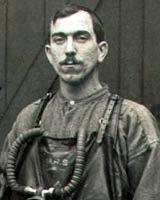 I do have a mines rescue newsletter somewhere in which he was thrilled to be on the team picture. Happy memories of a very special person.